Posted Apr 27, 2018 by Eds. After the justified uproar over pro-Trump Sinclair Broadcast Group forcing its scores of affiliates to humiliate themselves by reading an on-air script condemning “misleading” news, one would think other media outlets would be a little more careful not to mimic such behavior. Nonetheless, MSNBC—which rightfully tore into Sinclair Broadcast (4/2/18) for having its news reporters read off a corporate script—did a toned-down version of the same thing last Friday on Morning Joe (4/20/18). This is, I think, the way we can bring the world to where Mandela wanted us, where corporations don’t become expansive and influential just for personal wealth, but for a purpose, so that we have the ability to do good. The section was presented as news, though branded with Comcast’s logo and intro music. 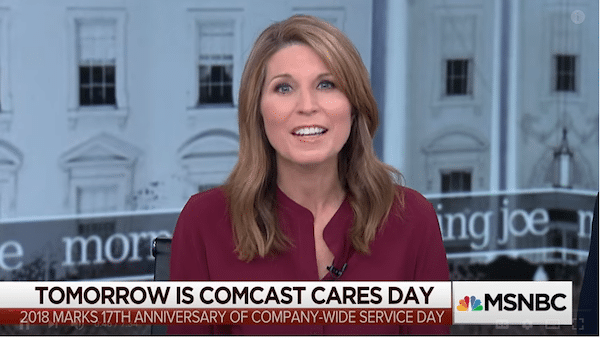 Anchor Nicolle Wallace began by reading from a Comcast press release that described “Comcast Cares Day” as “the nation’s largest single-day corporate volunteer effort”: “It is believed to be the largest single-day corporate volunteer event,” she insisted. “Believed” by whom? Well, Comcast’s marketing department, which is evidently enough to assert it as fact. 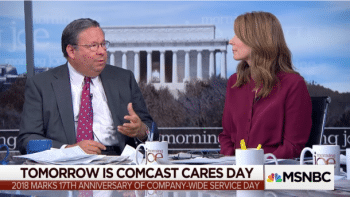 Virtually the same language was used by other Comcast properties, including NBC’s Today show (4/21/18, “the nation’s largest single-day corporate volunteer effort”) and Boston NBC 10 (4/21/18, “the nation’s largest single-day corporate volunteer effort”). NBC affiliates across the nation “pitched in.” NBC Bay Area, for example, ran a PR–sounding segment that was a lot like all of the other ones. So did NBC 5 in Fort Worth, TX, NBC 10 in Philadelphia, NBC 4 in Los Angeles, NBC 5 in Chicagoand NBC Connecticut, to name a few. Other media outlets joined in, including ABC’s WTXL in Tallahassee, Florida, the Denver Post and the Tennessean, among others. 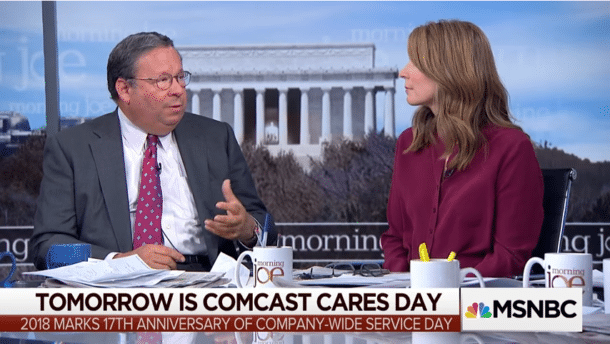 A general set of talking points was handed down by Comcast corporate to highlight how wholesome and caring Comcast is, and the company’s supposedly independent news outlets read it almost verbatim–a useful piece of image curation, since Comcast repeatedly tops lists of the most-hated corporations in the United States. Editors and producers frequently assure media consumers there’s a “church and state divide” in the newsroom separating reporting from the commercial side of the business. Based on this creepy series of infomercials, one is compelled to wonder what influence, both subtle and direct, Comcast corporate has on its properties’ coverage on a day-to-day basis. FAIR (2/19/14) noted the softball coverage Morning Joe gave to the attempted takeover of Time Warner by Comcast; “Comcast seems to be doing everything right over the past four or five years” was how host Joe Scarborough prefaced one question to his boss, Comcast CEO Brian Roberts. The Tonight Show, Comcast-owned NBC’s late night program, brought on then-President Barack Obama to do a pitch for TPP, which host Jimmy Fallon “slow-jammed” to–a segment that was then featured on Vox, a website whose major investor is Comcast (FAIR.org, 6/11/16). 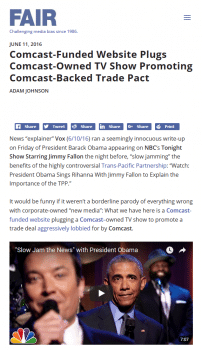 Vox earlier ran an “explainer” on how much money its corporate backer saves consumers (FAIR.org, 9/9/15): “Comcast may not be much loved by its customers, but it has the weight of their collective voice in its bargaining over carriage fees,” the website reported. Perhaps Comcast public relations reps would argue that dozens of Comcast“news” outlets reading off a Comcast script isn’t as sinister as what Sinclair did, because Comcast was promoting “corporate volunteerism” rather than Trump’s agenda. This is true as far as it goes, but it doesn’t go very far. There are presumably dozens of corporate volunteer events every week MSNBC doesn’t cover; the reason they had a full on PR blitz for this one was because they were exploiting the credibility of their news programs to help polish the image of one of those most-loathed corporations on Earth. Whether it’s the Trump administration or sleazy cable companies, news outlets should be reporting news, not doctoring up thinly veiled press releases for their corporate owners.